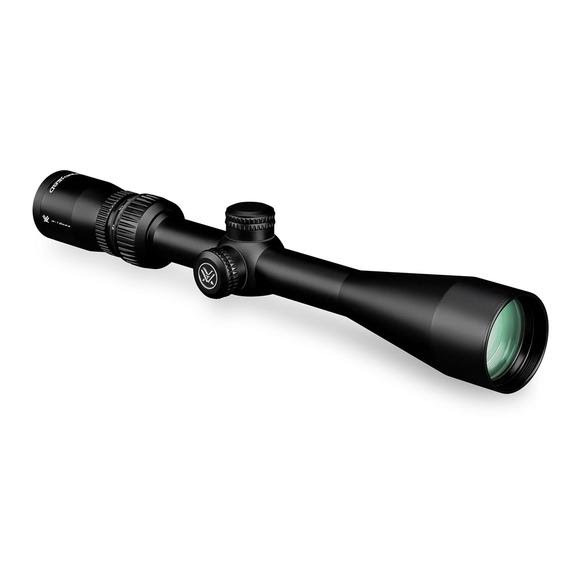 The long eye relief, locking diopter, and fully multi-coated lenses are just a few of the reasons the Vortex Copperhead 4-12x44 BDC Riflescope is a crowd pleasing favorite. Tough construction and bright images are just the icing on the cake. Its hard anodized single-piece aircraft-grade aluminum tube is nitrogen purged and o-ring sealed for waterproof/fogproof/weatherproof performance. Is less susceptible to accidental impact damage. Allow re-indexing of the turret housing to zero after sighting in the riflescope and generally requires use of a coin or wrench. Customized dot design helps eliminate guesswork on holdover and windage corrections. Good for hunting/shooting at varying ranges where estimating holdover is a concern. Excellent scope!!! Use it on my 30-06 and it is a great scope!!!! Will switch to all Vortex for all of my scopes!!! Bob Wards was great to deal with and had in 3 days, during the Christmas rush!